It's probably as close to the Royal Wedding as we were going to get! A wedding photo booth for a wonderful couple in beautiful Blenheim Palace. Their wedding was beautifully styled with an emphasis on blue, golds and blush pinks. Their wedding stationary was a fantastic starting point for us, as we designed and created their photo booth print out template and custom photo booth screens. Marble was also a big feature across their stationary, and this became our main focus for their photo booth theme. We created their photo print out design to reflect their invitations and wedding website and the choice of our white marble backdrop worked beautifully in the palatial environment. As with all our weddings and events, we create one of a kind photo booth print out designs to complement the style of the day. It's the small details that make the difference. And there was a whole heap of custom props too! Featuring country flags, personalised champagne bottles, flower crowns and even a Dumb and Dumber Hat. We had so much fun creating them, and more importantly the guests loved the personalised touch. The flags were a particular hit! We also organised their guest book. The bride came up with a brilliant way to personalise the front, and asked if we could create a cut out of a photo of herself and her husband-to-be to feature on the front cover. It was a request we couldn't refuse, and we think the result was fantastic and more importantly very unique to them. One of the awesome features of The Proper Booth is our original photo printing option. It's a bit like having your very own Jessops on site at your wedding. Guests can choose to print out their three photos on one designed print out or just the original photos, or both! And let's not forget the awesome slide show we created so they could easily share all their photo booth antics. These slideshows are a great way to get the vibe of the party across without having guests scroll through galleries of images. Plus they are way more fun! 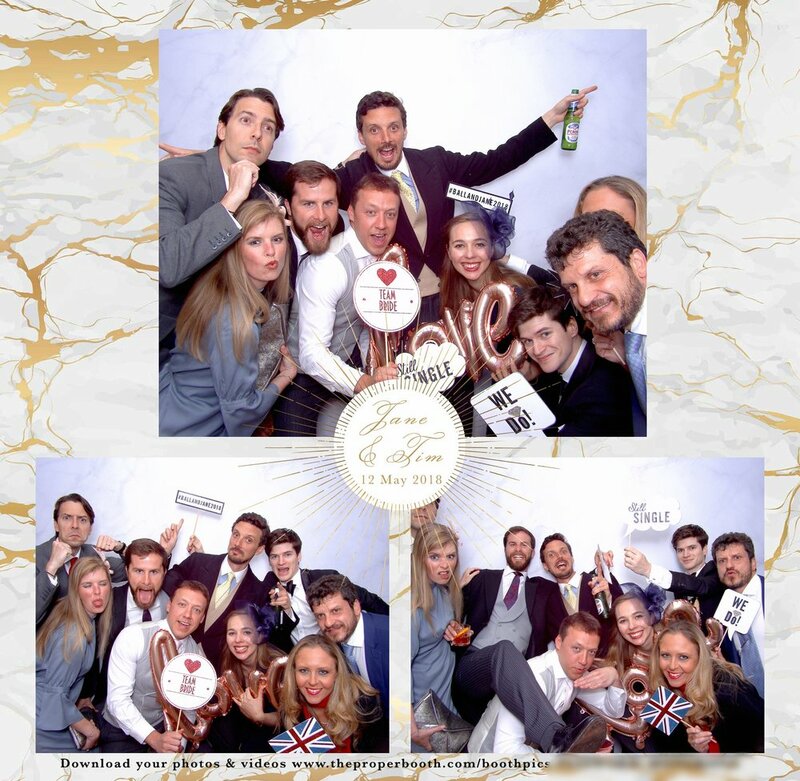 If this what you're looking for from your photo booth company, it's time to get in touch with us!